Brickwork is the pioneer of the virtual office business. We provide virtual sourcing services for businesses across the globe. 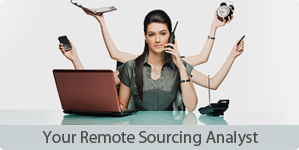 Our well informed Remote Sourcing Analysts (RSAs) can provide support at any or all stages of your sourcing lifecycle. Your “Virtual Sourcing Office” can be a large team of analysts supporting large companies with established procurement processes or a one-man-show to function as your entire procurement consulting office. More and more companies are executing their Supply Chain Management (SCM) operations by the use of SCM software thereby saving considerable time and effort. Small to Medium companies can also be part of the race by the usage of low cost optimal software that also gives them a clearer view of their SCM process. With India expected to spend 100 billion USD over the next decade to modernize its armed forces, global defence players would be contributing to Indian SME defence component suppliers in a major way with the aid of the improved Defense Offset Policy and its FDI clause. One of the ways for a company to increase the efficiency of its supply chain is the usage of metal pallet in their production line which would be reusable and easily maintained and the long term benefits are evident. Companies that are using metal pallets benefit in the long run compared to their counterparts who still resort to the traditional pallet. China being the largest consumer of garment products throughout the world is witnessing increasing domestic demand for garments thus resulting in several leading fast fashion apparel players expanding their focus from first tier to lower tier cities across China. Scotland shipping industry which makes up one third of the UK shipbuilding market is expanding from defence shipping requirements to include production of small leisure crafts and construction of specialist vessels such as gas and chemical carriers. The Egyptian mining sector is looking to break free from the barrage of complaints due to the use of low cost mining equipment by adopting global sourcing. With Sudan being heavily dependent on technology imports for electric power generation, the Sudanese government has been emphasizing the building of a national electric grid to address issue of frequent power breaks. With 78 overseas delegations in participation at Aero India 2013 the expanding potential of defence sourcing from India has come into focus, the event increased awareness of defence collaborations with defence component manufacturers in India. Australian pharma majors are increasingly adopting an approach of sourcing materials for generic drug production and drug manufacturing equipment from other countries in the Asia Pacific region. Germany being the gateway to the auto market of Europe has seen increase in auto exports after 2010. The expanding German auto ancillary industry will help the German automobile sector stay competitive. The Kuwaiti oil and gas sector has broken out from its tag of being a closed and hard to penetrate market, and is looking for expansion with increased foreign direct investments and technology collaborations. The recovery of the Canadian mining sector has been largely based on Chinese demand for metals and this bodes well as there is an increase in global sourcing of mining equipment and machinery. With tremendous opportunity for real estate developers in Qatar comes the pressing need to adopt global sourcing of construction supplies. Real estate transactions almost doubled in 2012 and with the impending 2022 FIFA world cup it is bound to skyrocket. Angola is looking to increase oil production to boost earnings; to ensure this the focus is on having oilfields with modern technology and also on generating more foreign investment. The electronics manufacturing sector in India is growing at a rate of over 25% and is well on its way to reach the estimated market value of US$ 400 billion by 2020. India’s casting and foundry industry with its several operational advantages, including low cost labor and tooling, is increasingly becoming the hub for global casting and component manufacturers. The makeover of the Indian cosmetics industry has been unparalleled as the expenditure on branded cosmetics in India sees an increase of over 75% in the past decade. The favorable macroeconomic environment created by the government of Ghana has helped the country emerge as Africa’s new investment hot spot and ensure increased FDI. India’s auto component industry has been witnessing a growth of 20% per annum with over 15% of the total revenue being derived from exports. We can represent you at all Indian trade fairs, exhibitions, and conventions. Watech Asia: 09-11 Apr 2014 – MumbaiThe Watech Asia event scheduled to be held from 9-11 April 2014 at Bombay Convention & Exhibition Centre provides ample opportunities for all its participants to take a collective look at all the newest innovations and technological advancements from the water technology sector. At this event there will be discussions on the utility of renewable energy sources and also hosting of the eco-friendly tools. A broad range of high utility leakage control equipments, irrigation systems, desalination tools, electrical vehicles, flow control devices and many other related items will be put on display at the show. More than 3000 enthusiastic attendees which include a great number of competent buyers are anticipated to take part in the event. The products for energy conservation will also be highlighted at this event. Along with this there will also be convenient networking and business development opportunities for the participants of this event. Over 100 well-known exhibitors are anticipated to be present at the show. ChemProTech India: 10-11 Apr 2014 - MumbaiThe ChemProTech India 2014 event organized by DMG World, Koelnmesse YA Tradefair & Chemical Weekly. It is also supported other important associations is a well know international exhibition, which focuses on Chemical Process Technology, Equipments & Supplies. This event will provide a very good opportunity to all the exhibitors and visitors to create a business network. Weld India Expo: 10-12 Apr 2014 - New DelhiThe Weld India Expo event scheduled to be held from 10-12 April 2014 in Pragati Maidan, New Delhi will display the welding and cutting industry and its allied products. The event will provide the best platform for exhibitors to showcase their new products and ideas to the trade and welding sector. Diemould India-Mumbai: 17-20 Apr 2014 - MumbaiThe Diemould India-Mumbai event scheduled to be held from 17-20 Apr 2014 at the Bombay Exhibition Centre (BEC) will offer a platform to showcase and market the various products from the tooling industry. International Industrial Expo: 19-21 Apr 2014 - New DelhiThe International Industrial Expo event scheduled to be held from 19-20 April 2014 in New Delhi is anticipated to have 15,000 plus visitors per day from different segments of the industry. To help guide the participants to booth swiftly, exhibits have been organized in pavilions that are geared towards specific Industries, Technologies and Solutions. Education Worldwide India-Delhi: 19-20 Apr 2014 - New DelhiThe Education Worldwide India event scheduled to be held from 19-20 April 2014, in Delhi. It targets the potential undergraduate & postgraduate students heading towards achieving education in the famous & reputed Institutions in India & Abroad. The event will see the participation of more than 200 universities from various countries. These universities will showcase their courses to the booming student population of India. Education Worldwide India: 22-Apr-14 - MumbaiThe Education Worldwide India event to be held in Mumbai dedicates itself in bringing new developments in the educational sector for the educational professionals and scholars. This event offers a meeting place where the leaders and professors who have lot of experience in the education sector will give expert advice to the students. The event will also have the presence of representatives from leading universities and colleges who will provide fees structures and admission information of the respective colleges. Along with this, a range of educational courses and programs will be promoted in this show. VIV India: 23-25 Apr 2014 - BangaloreThe VIV India livestock and dairy sector trade show in India has more than 10,000 visitors participating on a regular basis. Information related to the current market trends and the latest news from this sector is closely discussed at the show and the participating companies are offered grand business networking scopes here. This show brings in more than 150 professional exhibitors, who will exhibit a wide collection of egg production units, processing systems, poultry breeding facilities, feed management services, animal health products and fish farming equipments are put on exhibit at the show. The show will also have the presence of several renowned aquaculture professionals, veterinary experts, researchers and senior corporate executives. The event will have a large group of foreign participants as well. The show which is anticipated to take place from 23-25 April 2014 in Bangalore, takes up a total gross covered area of 5900 square meters. Pharma Pro&Pack Expo: 24-26 Apr 2014 - MumbaiThe PHARMA Pro&Pack Expo 2014 organized by IPMMA to be held at Mumbai helps the exhibitors from all over the world to come together and showcase their products and services in front of a large number of professionals and decision makers. This event proves to be a perfect platform for the exhibitors to enter the international market. It also gives them a good opportunity to expand their business prospects. The attendees of this three day international show will have a chance to get a forum for discussion on the new trends and latest technologies that have been produced in the pharma industry along with making their relationship stronger with each other. More than 250 companies will take part in this show to exhibit their products and achieve new business opportunities. Fresh Produce India: 24-26 Apr 2014 - PuneThe Fresh Produce India event scheduled to take place from 24-26 April 2014 in Pune, is India's leading three day event for horticulture production. This event displays products such as fruits, berries, vegetables and potatoes. Along with this will be displayed, upcoming technologies, seeds and nurseries and related technologies, drip irrigation and other irrigation systems, soil preparation, planting, spraying and harvesting equipment, fruit growing machinery, equipment and materials: sprayers, meteorological stations, trellis, hail nets, frost protection, fruit harvesters, orchard tractors etc and in the conference program the discussions from the experts will be carried out for analyzing the status and strategies of the Indian market. There will also discussion on the new market opportunities for Indian suppliers and challenges of sustainability. iPhex: 21-23 May 2014 - MumbaiThe iPhex event organized by Pharmaceuticals Export Promotion Council of India, scheduled to be held at Bombay Exhibition Center from 21-23 May 2014 would bring forward the benefits and solutions of the pharmaceutical sector, including the medical, hospital, drugs and surgical segments. The show has made an attempt to do something innovative like arranging several other programs that will incorporate a number of information about the mentioned sector apart from the usual display of products and services. The professionals who will be attending the event will come across India Technology Seminars, International Buyer Seller Meet, Product Launches, Manufacturers Presentation and Trade and Investment Seminars. These parallel running programs within the show are conducted by the experts in the respective fields. The organizers together with the exhibitors have made this show as one of the leading ones in the global market. Paper Today: 25-27 Apr 2014 - ChennaiThe Paper Today is one of the biggest trade events for the paper industry that presents the current technologies employed in the paper, pulp and board industries as well as to the printing, converting and office supplies business. The event is being held during the same time at which the Nprintech event which is an exhibition for the next generation printing technology is also being conducted. Screen & Textile Printing Expo-Chennai: 26-28 Apr 2014 - Chennai The Screen & Textile Printing Expo event organized by Buysell Interactions Pvt. Ltd. scheduled to be held from 26-28 April 2014 at the Chennai Trade Centre in Chennai. It is acclaimed as one of the special exhibition for displaying screen, textile & digital printing equipment, machinery. The event proves to be a good platform in bringing both exhibitors & visitors under the same roof, where large numbers of technologically driven products such as drying equipment, adhesives, stencil development equipment, pad printing equipment etc are displayed. Beauty & Spa Expo: 05-06 May 2014 - MumbaiThe Beauty & Spa Expo event to be held from 5-6 May 2014 at the Bombay Convention & Exhibition Centre (BCEC) in Mumbai, India exhibits products related to Beauty & Hair Salon, Cosmetology & Aesthetics Machines, Spa & Retail , Cosmetic Ingredients, Cosmetic Packaging, Contract Manufacturers etc. from the cosmetics and beauty products, industrial products, and fashion accessories industries. DistribuTech India: 05-07 May 2014 - New DelhiThe DistribuTECH India event scheduled to be held from 5-7 May 2014 will be held at Pragati Maidan of New Delhi. This event will display different technologically sound products, services and equipments of power and energy industry of India and abroad. Discussions on the key issues and advancements of the industry in India and across the world are also organized between the experts of the industry. Led Expo Mumbai: 08-10 May 2014- MumbaiThe LED Expo Mumbai event scheduled to be held from 8-10 May 2014 is the leading event of India that focuses on the Electronic & Electrical Industry. The event sets a new standard for the industry by showcasing the varied technologies and new innovations that are taking place in the sector. The LEDs are an overwhelming source of lighting in the world and any latest development or advancement related with these products will always help the industry to grow and expand. The event will help the industry to give complete focus on it and maintain a good and bright future. The products and services that will be displayed in the sector will include all the quality products and items that maintain a good standard. The exhibitors will get a great platform to exhibit their products and services and launch new products and designs that will be very beneficial for their company. The Manufacturing IT Summit: 9-May-14 - MumbaiThe Manufacturing IT Summit 2014 event will be held in Mumbai and will attract IT leaders, strategists and solution providers from manufacturing sector to discuss about the latest produces and services. Some of the highlights of this event would be interactive sessions and real life case studies. The 5th Edition of this event will have industry leaders and key market players discuss about the role of IT to maximize production, designing of innovative products and removal of wasteful activities. Participants will have the chance to interact with industry stalwarts and probable business clients. Plans and strategies related to cloud computing, display of latest products and demonstration of innovative service and products will be the combined package of this summit. The show is anticipated to have more than 150 decision makers who will share their views about the modern trends associated with role of IT in manufacturing industry. Times Education Boutique – Delhi: 09-11 May 2014 - New DelhiThe Times Education Boutique to be held on from 9-11 May 2014 will improve the business prospects and help you endorse your institute on a large scale. . As students will become more aware and focused, a lot of issues related to admissions, results and performance will also be resolved. The participants will have the opportunity to meet and interact with the students on one-to-one basis, getting a clear understanding of students' requirements, their potential & interests. Accordingly the participants will be able to guide the students and inform them about a particular field. G-Fair Korea 2014: 14-15 May 2014 - MumbaiThe G-Fair Korea 2014 event is a combination of a trade show and one-on-one meeting ground, for the Indian companies to deal and interact in person with quality Korean suppliers in a vibrant business environment. The fair will have over 80 Korean suppliers and products ranging from electronics & electrical, medical equipments, consumer products, industrial equipments and more. This fair is set to provide vast opportunities to the Indian companies. Smart Outsourcing Expo: 15-17 May 2014 - BangaloreThe Smart Outsourcing Expo is a three day event scheduled to be held from 15-17 May 2014 at Hotel Lalit Ashok in Bangalore, India. This event exhibits products in the Industrial Products industry such as E- Governance, R & D and Clinical research, Financial services, Marketing, Engineering service, LPO and KPO etc. Ecobuild India: 15-17 May 2014 - MumbaiThe Ecobuild India 2014 is a three day event to be held from 15-17 May 2014 at the BEC in Mumbai. It is the largest event of this sector which focuses on the future of sustainable building design, construction and built environment. This event is the entry point to the Indian market for the sustainable development of the augmentation of the sector. The event helps the exhibitors to display their products and services associated with the sector. This expo will bring together the government, builders, developers, builders, architects, technology providers, consultants and other professionals associated with the sector. A huge numbers of visitors and more than 150 exhibitors associated with the sector will visit the show. The exhibitors of the show will get a chance to connect and interact with all the attendees and get good scope for the development of their respective businesses. Roof India: 16-18 May 2014 - MumbaiThe Roof India event scheduled to be held from 16-18 May 2014 in Mumbai with the thematic focus on the roof construction system will exhibit an extensive range of products and services. This event stands out as a connective ground for the world class exhibitors and high end users. The exhibitors will display roofing systems, architectural cladding, facade engineering, roof waterproofing, pre engineered buildings, space frames and more. The forum will draw architects, structural engineers, civil engineers, quantity surveyors, roofing or civil contractors, real estate promoter or builders, consultants, factory or warehouse builders, town planners, landscape architects, key personnel from logistics companies and many more by providing them an opportunity to interact with one another. India Manufacturing Summit: 16-May-2014 - MumbaiThe India Manufacturing Summit 2014 show scheduled to be held on 16 May 2014 in Mumbai, India will serve the requirements of the manufacturing industry and represent the voice of the professionals associated with it. This show will provide a perfect platform to all the professionals and decision makers to come under the same roof and learn and discuss about the latest invention and issues in the Indian Manufacturing Industry. More than 150 decision makers will be present at the summit from different fields of automotive, cement, food and beverage, iron and steel, gems and jewellery, oil and gas, textiles and garments, aerospace and defense, chemicals, industrial equipments, mobility, high tech and consumer electronics, pharma and life science, process manufacturing and general manufacturing from across India. This summit provides a good opportunity for professionals to assess the requirements and needs of the manufacturing sectors of India and also jointly face the challenges projected in the sector. Metal Buildings & Steel Structures Expo: 22-24 May 2014 – MumbaiThe Metal Buildings & Steel Structures Expo 2014 (MBSS'14) event on Steel Structures & Allied Products is planned to be held from 22 - 24 May, 2014 at Bombay Exhibition Centre, Mumbai, India. A conference for a day will be held alongside the expo on 23 May 2014. MBSS is a plan designed to promote the use of steel and allied metals in construction industry. This is India’s flagship event which serves as a platform to exhibit the latest products & innovations in the industry. The event also proves to be a perfect platform for exploring new business opportunities and for broadcasting of knowledge in order to deliver world class technology/services. Telematics India and South Asia Conference and Exhibition: 28-29 May 2014 – BangaloreTelematics India and South Asia Conference and Exhibition is a two day event at the Bengaluru Marriott Hotel, Whitefield in Bangalore. This event exhibits products from the Telecom Products & Equipment, Business Services industries such as equipments, accessories related to automotive and telematics and more etc. Automotive Engineering Show: 29-31 May 2014 – PuneThe Automotive Engineering Show is a three day event being held from 29-31 May 2014 at the Auto Cluster Exhibition Centre in Pune, India. This event showcases products from the Automotive industry such as automotive components and manufacturing equipment, vision systems, metrology devices, robotics equipment, laser cutting devices, productivity enhancers, metal cutting tools, etc.. Fabrics & Accessories Trade Show: 30 May-01 Jun 2014 – BangaloreThe Fabrics & Accessories Trade Show 2014 scheduled to be held from 30 May -01 Jun 2014 is India's premier platform for the textile value chain. The 8th Edition of this show will provide manufacturers and suppliers of apparel, fabrics, trimmings, embellishments and related services to display their products to shrewd buyers from across the world. The trade show is considered as the most important international sourcing platform in India, which is used by big buyers. Professional Beauty Mumbai: 02-03 Jun 2014 – MumbaiThe Professional Beauty Mumbai is a two day event scheduled to be held from 2-3 June 2014 at the Bombay Exhibition Centre in Mumbai, India. This event exhibits products not only from the Cosmetics and Beauty industry but also from the Fashion Accessories industries. Food Hospitality World Bangalore: 12-14 Jun 2014 –Bangalore The Food Hospitality World Bangalore is a three day event scheduled to be held from 12-14 June 2014 in Bangalore, India. This event would displays products from the Food & Beverage industry such as Vinegar, Mushroom and Truffles, Grocery, Rice-Flour and Gastronomy, Confectionary, Frozen Food, Beverage, Green Food, Oil, Sea Food, Cereal Based Food like Pasta, Bakery Products and Gnocchi etc. Health & Beauty Expo - Chennai: 13-15 Jun 2014 – ChennaiA two day event Health & Beauty Expo is scheduled to be held from 13-15 Jun 2014 in Chennai is one of the most all-inclusive beauty and healthcare sector trade shows in India. The most recent industry activities and market trends are discussed in detail at the show. The show which boasts of more than 4000 qualified attendees will offer visitors exciting opportunities to learn more about viable mental stimulation and revitalization methods. A large collection of products related to fitness, homeopathy and allopathic medicinal supplies, grocery and frozen food items, cosmetics, nutritional products and other related goods are displayed during the event and over 100 well-known exhibitors are present here. Body rejuvenation products and efficient banking and insurance services are highlighted at the show too. The companies that would be participating at this event can expand their corporate networks and noted business entrepreneurs, social workers and medical practitioners would participate in the show as well. The buyers who would be attending can also put across their health requirements at the event. HEIMTEXTIL INDIA: 19-21 Jun 2014 - New DelhiA two day event HEIMTEXTIL INDIA scheduled to be held from 19-21 June 2014 is an international trade fair for home textiles and accessories. This event gives an opportunity to buyers with a broad range of products covering virtually all sections of the home textile industry that includes furniture fabrics, bed linen, bath linen, table and kitchen linen, accessories, floor coverings, wallpaper, window decoration. INFRA EDUCA: 21-22 Jun 2014 - New DelhiThe Infra Educa event scheduled to be held from 21-22 June 2014 in New Delhi will exhibit the entire view of education horizon & industry. It will give an insight into current subjects and courses available to the new generation students, and throw light on various schemes and program being offered by national and international agencies as well as government departments. Secutech India: 26-28 Jun 2014 – New DelhiThe Secutech India is a three day event scheduled to be held from 26-28 June 2014 at the Pragati Maidan in Delhi, India. This event provides a platform for the huge gathering of exhibitors from India and other countries to display latest technically sound products from IT Security industry such as CCTV, Digital Surveillance, Access Control, Intrusion Detection, Intercoms, Transmission, Management Platform, Building and Home Automation, Fire and Safety Products,Security Service, Facility Management Systems, Smart Card, Biometrics, RIFD, Identification and Authentication, Firewall, Public Key Infrastructure, Malicious Code Protection, Vulnerability Scanners, Forensics, Media Sanitizing etc. Pharmac South: 27-29 Jun 2014 – ChennaiPharmac South is a three day event scheduled to be held from 27-29 June 2014 in Chennai, India. This event exhibits products from the Medical & Pharmaceutical industry such as Contract Manufacturers, Pharmaceuticals, Nutraceuticals, Herbal, Veterinary Formulations etc. Zak Jewels Expo: 27-29 Jun 2014 - ChennaiA three day event Zak Jewels Expo organized by ZAK Trade Fairs and Exhibitions Private Limited scheduled to be held from 27-29 June 2014 at Vivanta by Taj Connemara, in Tamilnadu, will welcome from different parts of the world, a large number of buyers, sellers, exporters, importers and many more from the gems & jewellery industry.